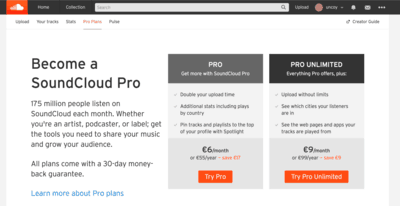 SoundCloud had way too many staff members for what is a fairly simple website. Their headcount was 422 out of which 173 have been given their walking papers. SoundCloud was also maintaining offices in Berlin, New York, San Francisco and London. For expensive real estate they only needed to add Paris and Tokyo for a perfect score. Fortunately, SoundCloud will cut back to Berlin and New York now. Someone needs to negotiate with the Americans (New York) while production and code and IT can all be done in Berlin. There's a need for some kind of design and marketing input from New York as Germans can be really clueless about marketing to anyone except Germans. Germans in a way don't really believe in marketing, they believe in the product. I'm a German at heart that way myself. Heaven knows I could do a better job with the FV Player marketing1 while with Martin we've done a great job on the software architecture. While Mercedes no longer makes cars which run 400,000 km without major service (I owned one), many German products remain very high quality. As some may remember, my favourite music service is Pandora (Deezer used to be a close second until they removed the "Hear This" feature). I listen to a lot of new music and discovery is important to me. That doesn't mean I want to explore a lot of genres I hate. There's a lot of good music in the world (in the sense of appealing to me) and I'd like to spend as much of my life as possible discovering those artists who will change my life for the better. Pandora gets you there faster than anyone else. I'm currently listening to Carla Bruni radio. 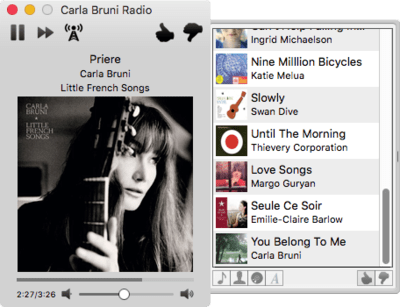 I only like Ms. Bruni's music about a 7 out of 10 but Pandora offers a mainly French female singer diet (way too much Ella Fitzgerald at first), leading me to discover four or five artists I didn't know. Pandora is also low-maintenance (it keeps playing without requiring adjusting playlists) and lets you tune your channels to your own tastes (no more Ella Fitzgerald much less Bossa Nova, lots more Indila, Andrea Lindsay, Thievery Corporation and Coeur de Pirate).